Bring on the vacation, sunscreen, and fun! Join your neighbors at the Lake Murray MusicFest & Fireworks on the Fourth of July for music, dancing, games, picnicking, or just relaxing with a great book. Would you like to go around the world in 80 days? The library has a book for that! Learn to love Paris and French-inspired cooking while reading “My Life in France,” by Julia Child. The 2018 Summer Reading Program (SRP), “Reading Takes You Everywhere,” gives the young and young at heart the opportunity to learn new things and live vicariously through reading. June 1—Aug. 1, register online for the SRP at sandiego.gov/public-library. Depending on your age, there are incentives and prizes for reading 10 hours or 10 books — but you must register and record your reading progress to win. At the San Carlos Branch, we have planned eight special SRP performances that will delight the entire family. All performances are on Wednesdays at 2:30 p.m., and last about 45 minutes. Passport to Animal Adventure, brought to us by Pacific Animals, is our first program on June 20. We will be introduced to some exotic animals from around the world and learn about the adaptations required for their survival in unique habitats. The following week, on June 27, a zany chemistry professor will perform gooey, slimy, and smoky experiments. On July 11, join us for a South American experience. Attendees will be encouraged to join in the fun as native stories and music are interwoven into a multicultural event. The Library Shop, located in the courtyard of the Downtown Central Library, is a nonprofit book and gift store, sponsored by the Friends of the San Diego Public Library and the San Diego Public Library Foundation. During the month of July, the Library Shop’s Where’s Waldo @ the Library contest will challenge you to find Waldo hiding at each of San Diego’s 36 branch libraries. To play, pick up a passport at your local branch and begin your hunt. When you find Waldo, have your passport stamped and receive that branch’s unique button. Continue your hunt at the other 35 branch libraries. Try to collect all 36 buttons; then take your passport to the Library Shop for a chance to win additional prizes. Children’s Yoga + Stories, Tuesdays, 4–4:45 p.m., ages 3–8: Kids will participate in story-inspired stretches and musical activities using child-friendly props. Please bring a mat or towel. Youth Chess, second and fourth Tuesdays, 5–7 p.m., ages 18 and under: Youth learn to play chess or hone their skills. All levels are welcome. Process Art, Thursdays, 4–5 p.m., ages 3-8: Kids get to experiment with a variety of art supplies, and make keepsakes for their parents. Storytime for Toddlers & Preschoolers, Fridays, 10-10:45 a.m.: Little ones listen to interactive stories and make a fun craft. June 5–July 5, the paintings of local artist Ruth Benjamin, will grace the walls of our Winer Family Community Room & Art Gallery. 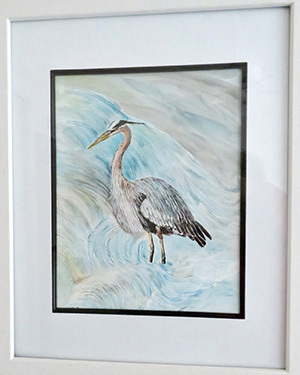 After her retirement as a teacher of special needs youth and adults, Benjamin began experimenting with the Asian art of sumi-e painting and a variety of unique watercolor techniques. Her paintings include many of the beauties of nature: aquatic birds, mammals, and fish as well as lovely botanical and landscape scenes. Meet our charming neighbor at her reception, Saturday, June 16, noon–2 p.m. Refreshments will be served. 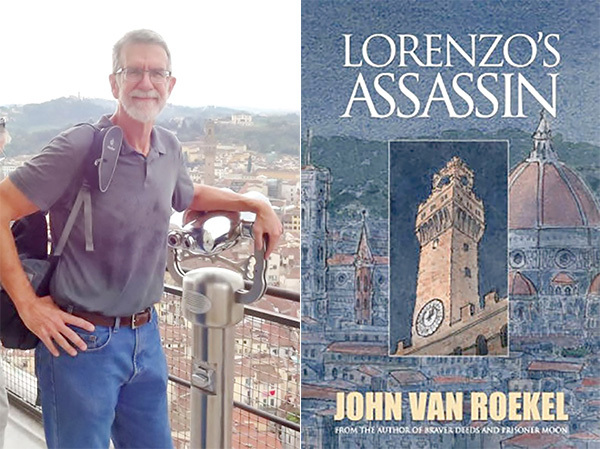 June 22, 2–3 p.m., author John Van Roekel, will speak about his novel, “Lorenzo’s Assassin.” This book is three intertwined stories of love, vengeance and forgiveness centered around the Pope’s request for the murder of Lorenzo the Magnificent. July 12, 12:30–2 p.m., the Library Book Club is talking about the repercussions of “Big Little Lies,” by Liane Moriarty. The book is based on a true story which centers on the friendship of three very different women, all of whom have kindergarten children in the same school. The theme is multifaceted and covers bullying, domestic abuse, lies, and finally murder. The book was adapted into a 2016 HBO seven-part series. Each month, a list of new adult and youth titles available at the San Carlos Branch may be found at bit.ly/2eLaVZY. June 8, 2–3 p.m.: With the hot weather coming, don’t miss “Hydration for Health.” Learn about what factors influence hydration needs, what are indicators of being safely hydrated, healthy beverage options and beverages to avoid, and helpful tips for staying well-hydrated. Every attendee will receive a free healthy snack and wellness guide with recipes and tips for healthy living. June 15, 2–3 p.m.: Aging & Independent Services presents, “Don’t Get Hooked: Preventing Financial Abuse, Scams, and Frauds.” This will be an interactive PowerPoint presentation for older adults, their families and caregivers, covering the latest scams proliferated on our aging population. Learn about these scams: grandparent, sweepstake and lottery, door to door, telemarketing, computer, IRS and other official-sounding government scams. “Don’t Get Hooked” booklets and other resources are provided for attendees. June 20 — Aug. 15: SRP special event, Wednesdays at 2:30 p.m.
—Sue Hotz is board member and publicity chair for the San Carlos Friends of the Library. Reach her at publicity@sancarlosfriendsofthelibrary.org.